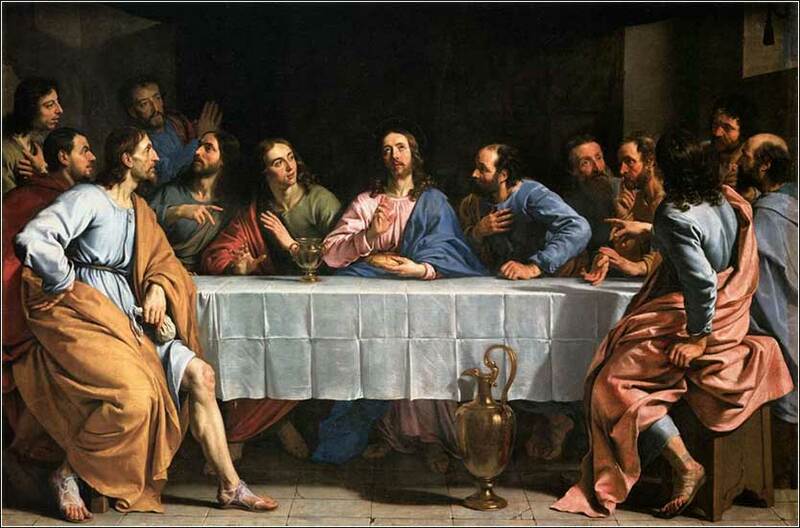 The Last Supper by Philippe de Champaigne ca. 1654. A favorite subject of Renaissance artists, de Champaigne’s rendition is notable for the powerful and realistic depiction of Judas, seen with his leg stretched out on the left, holding a bag of money. All of the faces are notable for their great character and realism - it makes us feel that the apostles are real human beings. Notice how they discuss and perhaps argue among themselves, about earthly issues, while Christ’s eyes look only on God. Father, may our human family not become separated from you by building barriers of race, color, class, or beliefs. Inspire us to recognize that we are all made in your image and likeness, so that we may grow in appreciation of all people, and encourage each other to grow in pride in who we are and who we are called to be. May we recognize your Son in our midst, and live truly as brothers and sisters. I pray this in the name of Christ, in remembrance of His love for the Samaritan woman at the well. There was a Pharisee named Nicodemus, a ruler of the Jews, who came to Jesus one night and said to Him, "Rabbi, we know that You have come from God as a teacher; for no one can do these signs that You do unless God is with him." Jesus answered, "Truly, unless one is born again he cannot see the kingdom of God." Nicodemus said to Him, "How can a man be born when he is old? He cannot enter his mother's womb a second time and be born, can he?" The wind blows where it wishes. You hear it, but you do not know where it comes from or where it is going; so it is with a person who is born of the Spirit." The concept of being "born again", as a tenet of Christian faith, is a touchy subject. The media has trained much of the population to equate it with a very specific faction of Christianity, zealous and outspoken, that not everyone finds appealing. Although it attracts some people, it repels others and actually discourages them from identifying themselves as Christians in public. Remember, however you may feel about it, that "God has many mansions". When you look at this metaphor at its source — the passage written above — you realize how much it informs the basic theology of all Christians. When we are baptized, the basic act of becoming Christian, we make a beginning. Our life is changed. We take a second step in becoming fully alive (although in a different way than when we are physically born). God's Holy Spirit comes to us and becomes available to us. It is the one aspect of God who is in direct contact with us during our physical lives, who lives with us in our everyday world, something theologians call the "immanence" of God. Like the wind, we can't see it and don't know exactly where it comes from, but if we pay attention we can see its effects in our lives. However we may feel about the term "born again Christian", so often used as a pejorative in the secular and anti-Christian segments of society, it is important to understand the underlying meaning of Christ's metaphor. Our baptism, with water symbolizing the Holy Spirit, creates a new life within us, a life that is lived in the invisible world of Christ and is ultimately more important then the life we live in the world of flesh. 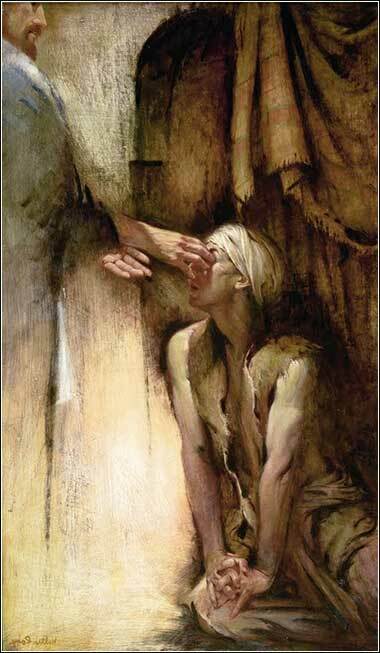 Christ Anoints the Blind Man by Walter Rane, contemporary.